Put the word ‘Bhangarh’ in Google search and the first result you get is ‘Bhangarh is known for its ruins where nobody dares to stay after…’ you eagerly want to know Stay after…। What? 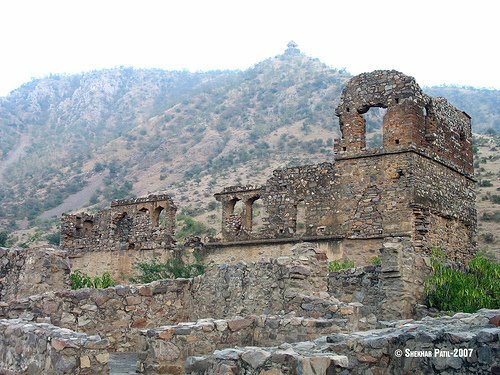 Well the second result to your query makes it simpler॥’ Thats Bhangarh in Rajasthan, which is the most, haunted Place in India as per Archeological Survey Of India। “STAYING HERE AFTER SUNSET IS STRICTLY …’ What did you say? Come again। Yeah you read it right. The most haunted place in India and according to ASI board put up there you can’t stay here after the sunset. When it comes from the ASI and not the hearsay, you tend to agree with the statement. Yet the curiosity in you wants to know more. Why can’t I stay there after the sunset! And what’s this ‘most haunted place in India, C’mon, you must be kidding. This is 21st century and you are talking about Ghosts’! My reaction was no different when my friend Ashwani Khanna, popularly known as ‘Ash’ in our bikers group mentioned this place to me. Not only this, he was too keen to visit this place and stay there as well. The biker in me, always looking for some excitement and new places, immediately fell for this one. I immediately booked my place with him. Now there were two of us and soon the word was circulated in our group (60kph) that when living for Bhangarh, twelve of us were ready to vroom on our bikes to the most haunted place in India. On further research on the net we learnt that the place is somewhere on the way to Jaipur via Alwar. It sounded better since we were all from Delhi and it could be done on a weekend. On the set D day we started our exciting journey with a bit of qualm. Everyone was chirping yet somewhere the hesitation and uncertainty persisted in our minds. Thinking that the place is not far off, we started late and with leisure halts we kept on riding on a slow pace on the single lane state highways after crossing Alwar via sariska. By the time we made it to Bhangarh it was already dark. Finally we were there. The most haunted place in India. The next task was to spend the night there and get to the truth. As per the notice board of ASI, they would not allow us to stay there for the whole night. 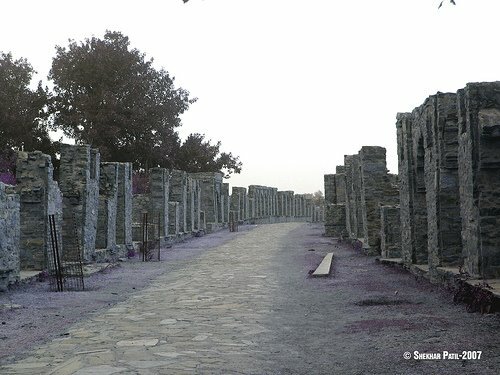 Since our primary reason to this place was to meet the ghosts and secondary to see the Bhangarh ruins. If we have to pass the night than why not amongst the ghosts, if they do exists. Immediately a plan of action was charted out. We had come prepared with three tents for the night stay. We divided ourselves into two groups. The first will go and look for the place to pitch the tents inside the ruins and second to go and arrange the food from the nearby dhaba (approx. 1 km from the ruins). The first group went on and reached the main entrance of the Bhangarh ruins. It was pitch dark and not soul around. We went near the gate and saw a shadow walking towards us. Oh my, was that a Ghost? We were getting ready for the any eventuality and waited patiently for the shadow, which turned out to be a Guard from the ASI. Soon another shadow, I mean the second guard also joined him and after the usual pleasantries both flatly refused to entertain us at that hour of the night informing us about the rule of entry restriction after the sunset. Now was the time to get the facts right. Are there any ghosts living here? Had they come across any such experience? Is it true that people who stays here do not go back alive? All these and many of other thoughts of ours going on in our mind were drowned with the buckets of cold water when both of them announced nothing such happened or happens. All these are rumours. But then why there is restriction on the entry after the sunset? Well, he announced very casually that it is because of the wild animals who probably comes to drink the water from the ‘kund’ within the ruins. Plus this rule applies to most of the places under ASI, isn’t it. How stupid of us! Why we didn’t ever thought on this angle. Now what. Somewhere in our mind we were still not ready to understand their point. After all we ripped off the whole world wide web to know if someone had stayed at Bhangarh ruins for the night and could not come across one single person claiming so and these guards are saying there are no ghosts. We ought to find that out ourselves. The next on the agenda became to pitch our tents there, which the guards had already politely refused. After much buttering and persuasion they agreed to allow us to pitch our tents near the gates to which we gladly agreed. Everyone was relieved and with full throttle we starting inflating our tents and by the time the food arrived, the tents were up. It was already past 9 in the evening. We had our dinner and the group started discussing the ghostly world. All this went on till 2.30 am before we said goodnight to each other and also taking a good look towards the ruins in that faint hope of some hallucinate effects. Alas… nothing. It was six in the morning and I heard some hollowing noise. Came out of the tent and it was our dear Langur running towards the ruins. I had the opportunity to have the glimpse of the ruins with the first ray of the sun and it was wow. The next couple of hours were spent clicking the early morning ruins of Bhangarh. It is about 34 kms from Dausa via Sainthal Mod, and 47 kms from Sariska, this place was once a flourishing town of 10,000 homes. According to legend, it was built in the 17th century by Raja Madho Singh, the younger brother of illustrious Man Singh (one of the nine gems of Akbar’s court). A quick look at the surrounding is enough to conclude that it definitely had a prosperous past. With a well planned bazaar and the famous Randiyon ka Mahal (Palace of Prostitutes) in the backdrop makes it a very fascinating sight. The palace in fact seems to be cross between a palace and a fort has definitely been built tastefully overlooking the green lawns and the temples. The temples are a treat to the eyes but seems to have been badly ripped off by the thieves till it came under the supervision of ASI. Ghosts or no ghosts, a visit to Bhangarh is a must for every traveller. The route from Delhi is via Bhiwadi-Alwar-Rajgarh-Tehla-Bhangarh and the road is excellent.